Some of the largest listed firms in Western and Northern Europe are partly owned by foundations. 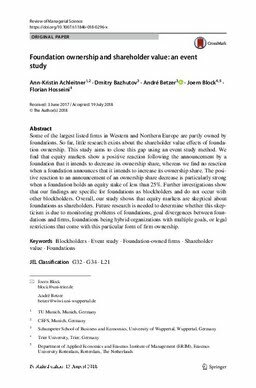 So far, little research exists about the shareholder value effects of foundation ownership. This study aims to close this gap using an event study method. We find that equity markets show a positive reaction following the announcement by a foundation that it intends to decrease its ownership share, whereas we find no reaction when a foundation announces that it intends to increase its ownership share. The positive reaction to an announcement of an ownership share decrease is particularly strong when a foundation holds an equity stake of less than 25%. Further investigations show that our findings are specific for foundations as blockholders and do not occur with other blockholders. Overall, our study shows that equity markets are skeptical about foundations as shareholders. Future research is needed to determine whether this skepticism is due to monitoring problems of foundations, goal divergences between foundations and firms, foundations being hybrid organizations with multiple goals, or legal restrictions that come with this particular form of firm ownership.